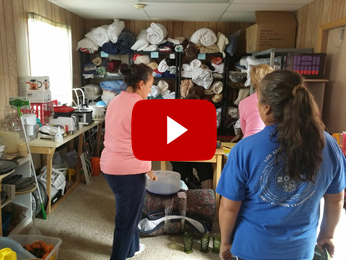 The Rio Rancho Renewed Hope Free Store is an outreach ministry with our neighbors that expresses the love of Jesus Christ through kindness and sharing material blessings with one another. Normal operations are the first and third Saturday of each month. What is a Free Store? We require no eligibility, ID, proof of residence or income to pick up items that are needed in a home. Clients do not pay for what they choose. Clients select household items from available stock, which are tallied and entered into the computer. There is a limit of ten items per month. There is also a selection of books. Store hours are from 9 am to 12 noon. Due to limited space, we can only accommodate two shoppers at a time, and we enforce a 15 minute time limit on heavy shopping days. However, we provide coffee and cookies for clients waiting their turn. ​We encourage the community to donate gently used household items and books to our store. Suggested items are bedding in all sizes, furniture, cookware, drinking glasses and cups, plates, silverware, etc. Donations may be dropped off in the bin provided during store hours. We are unable to accept clothing donations, ceiling fans, large appliances, and building supplies. ​The Free Store is run entirely by volunteers from RRUMC and from the community. Volunteers sign up for either the first or the third Saturday (or both). They work as clerks, hospitality greeters, registrars, sorters, and stockers.